The app I wanted to use to blog from my phone just spun and spun around. I attempted to download another one, but I’d forgot my password. Since it was becoming more work to try and not move from the kitchen table, where I was eating potato chips, than to walk to the “office” to blog, I quit my blog-from-phone operation. So, even though this is just your standard cat-photo-with-words-style post, I can state that I have not phoned it in! I’m exhausted without discernible cause. (Except health.) I spent the day thinking about how much cheaper it would be to live in Las Vegas. After doing some math and googling, I realized, it would work, but I’d have to live in Las Vegas. David wasn’t into it either, but I’ve always loved the idea of living in a hotel. He said he could see the allure for me, which is essentially non-stop air conditioning and room service. If the place had a 24-hour coffee shop/diner downstairs, I’d be in heaven. Week 2 begins tomorrow! More, more, more awesome bloggin’ to come. Aha! I was wondering what was up. Whew! Glad you’re still onboard the bloggin train. 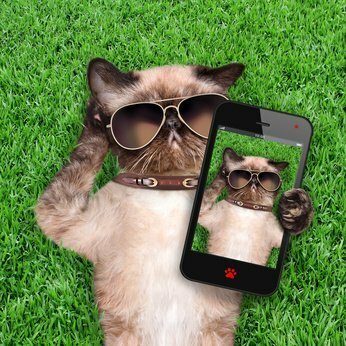 I like the cool kitty taking a selfie photo. And the hits keep a comin’. Yeah, I’m with David. Vegas for me is only good for a couple of days, but those few days are fun! Is David still on vacation? I have no idea what I’m doing for day 7. Think I might try something in Flash, but my free time is lapsing. Ugh. Mom and I went out for an early dinner yesterday. Found a great Columbian restaurant nearby.